'I feel so happy. I wanted my career to go like this,' Layanya Tripathy tells Radhika Rajamani. Former Miss Uttarakhand Layanya Tripathy made her debut in Telugu cinema in 2012 with Andhala Rakshasi. She went on to star in Doosulkeltha with Vishnu Manchu and Bhale Bhale Magadivoy with Nani, besides making a cameo in the Akkineni family film Manam. 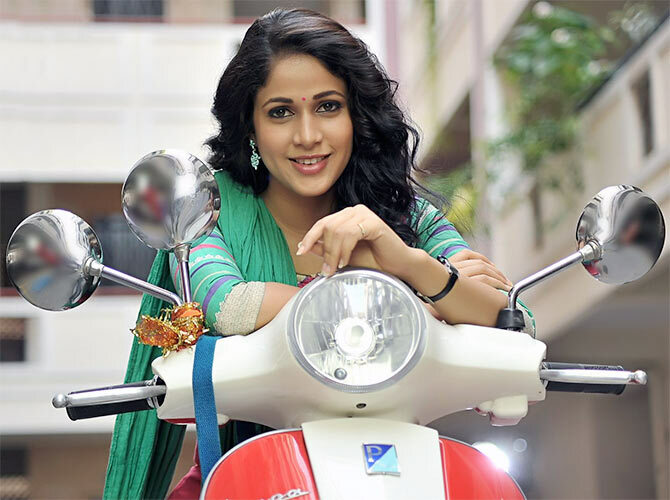 Lavanya has two films up for release: Lachmideviki O lekkundi and Soggade Chinni Nayana. In this exclusive conversation with Rediff.com contributor Radhika Rajamani, Lavanya discusses her new films. You have done five films in Telugu. How is it going so far? I feel so happy. I wanted my career to go like this. I see myself doing different characters. I took time to decide on scripts, and that's why I got good opportunities and different scripts. Are you comfortable with the language and the people in the Telugu film industry? Yes, from the first day itself. Language is not an issue for me. I am comfortable with Telugu. The people in the industry are warm, nice and humble. It feels like family. I have many friends here. How did Lachmideviki o Lekkundi happen? I wanted a nice script. Hanu Raghavapudi (director of Andhala Rakshasi) told me that he had a good script and that I should hear it. So I did. The story was interesting, and the character was different. There are three shades to the character. It was challenging. Initially, I did not know who the hero was. Later, Naveen Chandra came on board. The film is a crime comedy with romance. The attempt is to make it like a full meal. What are the three shades of your character? My main character is Devi an over-smart, self-obsessed girl who has friends on Facebook. She is a social networking person, while personally, people do not like her. My other characters are called Ankalamma and Uma Devi. One has to see the film to observe the importance of these characters. How was it acting with Naveen Chandra for the third time, including the Tamil film Brammam? It is always nice working with him. It is like working with a friend. For our first film Andhala Rakshasi, we took time to warm up and interact. That was also because the character was like that. This time, we talked more and it was more fun. Naveen is a nice, talented guy. Jagadish is a debutant though he worked with S S Rajamouli. What noteworthy aspects did you find in his script and direction? I loved his zeal. I saw the confidence in him; he knew what he wanted. He was there for every small thing. He was multi-tasking all the time. It was nice knowing him as a director. Have you got any Tamil projects? I keep getting scripts. If something amazing comes up, I don't mind taking it up. What are you doing next in Telugu? I am listening to scripts. I hope things will work out. I get bored easily. I like experimenting. On what basis do you sign a film? When I listen to a story, I visualise the film like a normal person. I like to follow my character and see if it's interesting. The story, character and director are important.